Biomedical Signal Processing, Medical Electronics, biomedical Instrumentation, Medical Image Processing, Voice Disorders, Stressed Speech Analysis, Speech Recognition, Speaker Recognition. 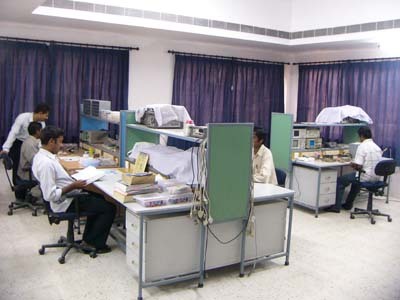 The thrust of biomedical research at IITG is on the electro medical signal processing and biomedical instrumentation. Current research includes analysis and processing of biomedical signals like ECG, EMG, EEG, fMRI and the fundus image and development of low cost biomedical instrumentation systems for the measurement and monitoring of various physiological parameters. The thrust of speech processing research at IITG is in the development of efficient speech processing systems. Current research includes analysis and processing of speech signals to extract vocal tract, excitation source and modulation components information from the speech signal. The usefulness of the extracted information is then explored in different speech processing tasks. The ongoing major research activities include study of source features for speech synthesis and speaker recognition, stressed speech analysis and processing, children speech recognition and speech enhancement. Development of online handwritting recognition system for Indian language (OHWR-phase-II-Deployment of an application and improvement of engine performance-Development of Assamese handwritten character recognition system DIT, Govt. of India. Speech-based Access for Agricultural Commodity Prices in Six Indian Language DIT, Govt. of India. Characterization and Compensation of Acoustic and Linguistic Mismatch for Robust Automatic Recognition of Children's Speech DIT, Govt. of India.